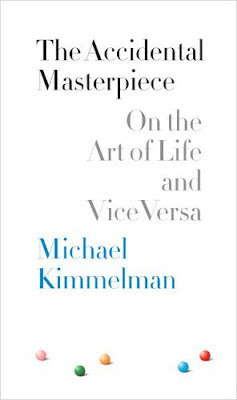 Michael Kimmelman's "The Accidental Masterpiece: On the Art of Life and Vice Versa" is a highly engaging and perspective shifting book shedding light on the process of making, and living, art. Kimmelman, the chief art critic of the New York Times, wrote this book in 2005 to a unanimous positive critical acclaim. What makes this book a treasure is its ability to translate for seasoned art lovers, as well as novices, the process, the inspiration and to some extent the meaning of art. The casual use of anecdotes on the life of everyone from Pierre Bonnard to Mathew Barney to Bob Ross (whose claim to fame was teaching instant landscape painting on TV) creates an entertaining and effective portrait on the scope of how we define "art" and the "artist." It is clear that Kimmelman has a deep love for his lifes' profession and a profoundly intuitive understanding of the creative spirit. Kimmelman ultimately sees art as relevant outside of the confines of the art world, in that according to Kimmelman art " provides us with clues about how to live our own lives more fully. "The Accidental Masterpiece" is a wonderful inspired work, for art enthusiasts as much as it is for those seeking clue to the roots of inspired living.